The smell of blooming lilacs filled the air. Now and again the fluffy clouds hid the mid-afternoon sun. When it shone, the spring rays warmed my back to the point of sweating. The propane burner uttered a constant, dull, whooshing roar that filled my heart with joy and radiated an equal amount of heat on my chest. Casting lead is serious business. The fumes from molten lead are highly toxic, and because lead melts at about 621 degrees Fahrenheit, the slightest splash burns skin and singes clothing. 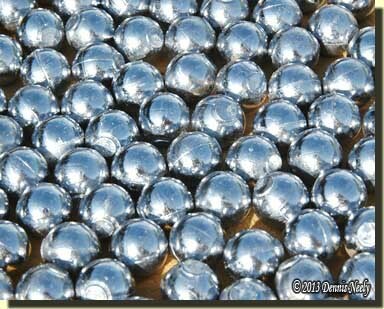 Safety is of the utmost concern, and constant care and forethought is a must when casting round balls. The plumber’s lead pot that I use was old and obsolete when I bought it, back in the late 1970s. It is certainly not as nice as some of the modern melting pots, but the price was right. The cast iron pot holds over thirty pounds of molten lead, but I like to work with about ten pounds. The propane company fitted it on an old style tank, short and squatty like a mushed pumpkin. The tank alone weighs almost sixty pounds filled and is quite stable, even when the lead pot is full. I prefer to cast in a slight breeze and out in the open, away from the shop. With the wind at my back, the fumes are always whisked away, plus I sit in a stable chair an arm’s length from the pot. I dress in jeans, a long-sleeved denim shirt and heavy work boots. Leather gloves are a must and I tuck the buttoned shirt sleeve into the cuff of the glove. I used to use a leather work apron, which is often recommended, but I found it got in the way. Safety glasses are a must, too; a face shield offers better protection yet. With the smaller, electric melting pots, pouring the lead into the mold is done over the pot, but that is not possible, or safe, using this propane-fired lead pot. I pour away from the pot, over a wide cottonwood board that was a cut-off from a Shaker-style tall clock that I built years ago. Inadvertent spills splash a bit when they hit the wood. I keep my feet pulled back under the chair to avoid the flying lead. Grandpa Olson’s cast iron ladle has a longer steel handle. He used it to pour Babbitt bearings in his youth when he worked as a mechanic rebuilding Model T engines. He gave it to me, and even though the handle gets hot, it works great with the wide-mouthed lead pot. I never pour lead or Babbitt without thinking of him, which for me, adds a sense of kinship to a modern task. The two-pound lead ingots are stored inside and the plastic pails are covered to avoid any contamination by water. Water turns to steam when it contacts molten lead, causing a “steam explosion” that can spatter the hot lead. Not long ago, one of the black powder forums had a thread about a steam explosion caused when a lead pipe was added to a melting pot. Unbeknownst to the fellow, one end of the pipe was plugged, trapping water that blew lead all over with great force. Fortunately, no one was injured. No Tradition? No Bag Mold? No Campfire? A number of years ago I bought a .600 “bag mold” in my quest to be an authentic Lower Great Lakes woodsman. I acquired a small, hand-forged ladle, made a steel mold to cast half-pound bars of “trade lead” and sewed a pillow ticking sack to stow the mold, ladle and a pound’s worth of chopped up bars. It took a few sessions, but I eventually caught on to producing descent lead balls using the hot coals of a burned-down campfire. From the start, the sack’s pound-plus weight, coupled with a goodly bulk, proved a problem. It didn’t fit in my shot pouch, and was a bit much for my hunting bag. It eventually made its way to my bedroll, and that didn’t work well, either. The ball molding sack resided in my wooden cassette for a while, but now stays home. Like some traditional black powder hunting accoutrements, the bag mold and supporting supplies are victims of a better understanding of the historical record. The hand-forged ladle and a gang mold for making round ball, buck shot and cast bird shot. But bullet molds are conspicuously absent from the trade inventories, both at the posts and on the trading manifests for the Montreal canoes that transported goods on the Great Lakes. In addition, in the late 18th century, bulk lead is also absent. Rather, precast round balls were shipped by the sack full to the various trading posts, offering a monopolistic commodity for securing beaver pelts. On October 1, 1804, Francois Victor Malhiot, a North West Company clerk, recorded the sale of “sixty bullets” in the company ledger for two prime beaver pelts (Malhiot, 220). Similar transactions appear throughout the ledger. In addition, the inventory of goods sent to “The Ouisecansaint” includes “1 sack of bullets” valued at 40 plu, or prime beaver pelts (Ibid, 222). Based on the standard 30 bullets per plu, that is 1,200 round balls with an approximate weight of 50 pounds. The documentation shows the Native Americans, white captives or employees of the various competing fur companies depended on the traders for their round balls and shot. If a hunter owned a rifle, he could always trade for standard round balls and melt them down, which was done, but the hunter who owned a gun purchased from the post depended on the trader to supply the round balls. With that in mind, I choose to cast a couple hundred round balls in an afternoon, and limit the amount I carry for hunting to about a dozen. Although limiting the historical me to three rounds is period-correct according to Tanner, I do not follow this practice out of respect for the game I pursue. And when someone asks if I carry a bullet mold and cast my own round balls over an open fire, I state simply that I must purchase my round balls, shot and gunpowder from the North West Company trading post. The trader’s name is Samuel, and I hunt for him, on occasion. A prime beaver will buy 30 round balls, a handful of shot or a double handful of gunpowder. A small, scruffy beaver pelt, far from “prime,” purchases fifteen balls, if I bargain hard. 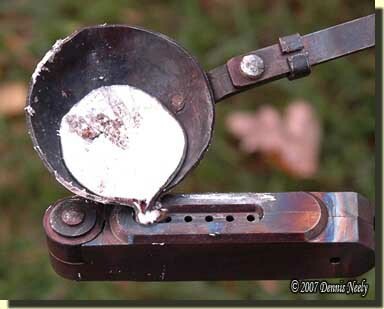 This entry was posted in Safety, Skills and tagged Dennis Neely, historical trekking, North West trade gun, trade gun, traditional black powder, traditional black powder hunting, traditional blackpowder, traditional blackpowder hunting. Bookmark the permalink.